Last week, I had the pleasure of presenting at the PA Writing & Literature Project (PAWLP) Summer Institute on using visual tools in multigenre composition. One of the visual tools that I discussed was the use of infographics. 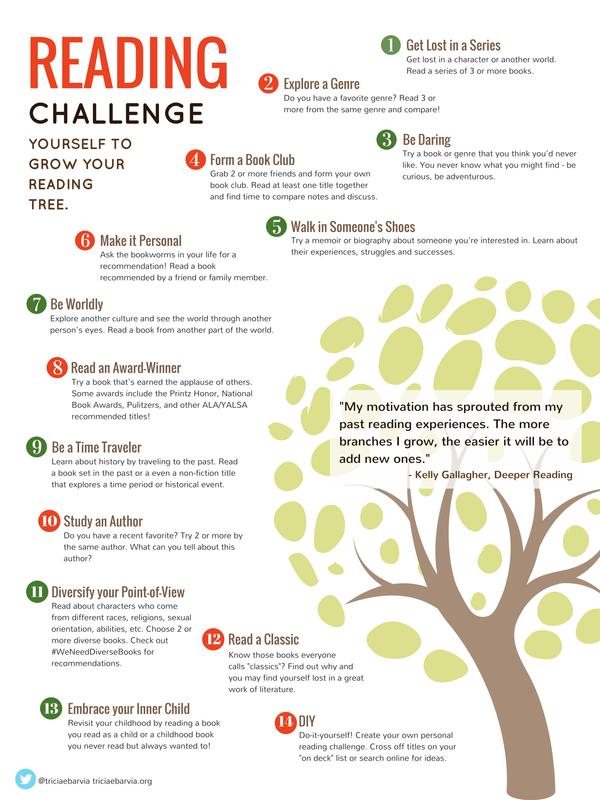 Then in my Twitter feed this past weekend, I came across Cheryl’s Mizerny’s list of reading challenges for her students. I’d been brainstorming a similar list in my writer’s notebook, but seeing Cheryl’s list motivated me to finally put the finishing touches on my own for my students. As I put together this list of challenges, I thought back to what Kelly Gallagher wrote in Deeper Reading. In a section he calls “Nurturing Palm Trees,” he writes, “My motivation has sprouted from past reading experiences. The more branches I grow, the easier it will be to add new ones. All readers have their own branches―and they are varied.” As a reader, I know this to be all too true, and when I look back on my own reading life, I can see exactly how my reading branches sprouted and grew―from my Sweet Valley High obsession to, eventually, Jane Eyre, or from the Nancy Drew series to the Girl with a Dragon tattoo books (now that’s progression 🙂 ). Gallagher also points out that “Growing a branch on a healthy tree is a lot easier than starting from just a seed.” As a teacher, I need to find ways to help students grow more branches. In the end, I put together an infographic with 14 reading challenges to hopefully inspire my students this coming year. In addition to posting it on my teaching website, I also formatted it as an 18×24 inch poster that I can print out and hang up in my classroom. I used Canva to make the design and VistaPrint for printing. NOTE: Clicking on the image above will bring you to a larger sized png image file that may be suitable for smaller size printing – my guess would be in the 16×20 range, but I’m not sure. Click here to view and save the PDF, which is suitable for printing to 18×24 (that’s what I did). If you do use it or plan to use it in your classroom, let me know – I’d love to know how it goes. Or if you have any other idea for reading challenges, please share below. Thanks!